FTA is particularly useful in functional paths of high complexity in which the outcome of one or more combinations of noncritical events may produce an undesirable critical event. 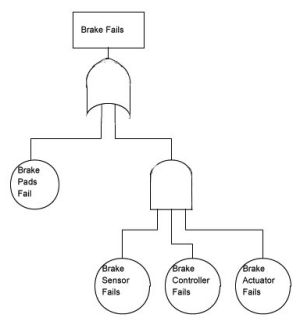 Typical candidates for fault tree analysis are functional paths or interfaces which could have critical impact on flight safety, munitions handling safety, safety of operating and maintenance personnel, and probability of error free command in automated systems in which a multiplicity of redundant and overlapping outputs may be involved. The fault tree provides a concise and orderly description of the various combinations of possible occurrences within the system which can result in a predetermined critical output event. FTA is a “top down” method of analysis compared to Failure Modes Effects and Criticality Analysis (FMECA) which is a “bottoms up” method. FMECAs and FTAs are compatible methods of risk analysis, with the choice of method dependent on the nature of the risk to be evaluated. There are some differences. Because FTA is a top down analysis there is a higher probability of misinterpretation at the lowest level. On the other hand, with the FMECA starting at the lowest level, it will probably result in a better method of risk analysis (assuming lowest level data is available). Also, the FMECA considers only single failures while FTA considers multiple failures which will impact accuracy.